I never understood the macaron craze. But again, I never understood the cupcake craze either. 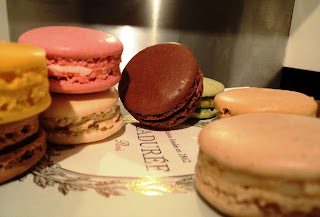 Truth be told, I have never tried a proper macaron (surprise noises from my dear readers). I only had one from Paul’s last year but it was so old and stale that it doesn’t really count. However, reading an entire recipe book on how to create the perfect macaron, the idea intrigued me. You see, close to my old office was a huge bookstore. So whenever I got the chance I used to pop downstairs, sit on their comfortable couch and read their recipe books. Needless to say, those small breaks were like a breath of fresh air in my (old) life of numbers and spreadsheets. In one of these breaks, I read a book on macarons. I was amazed by the vast combinations of colours and flavours. Colour definitely must have been a factor for this craze. Not many foodstuffs offer such intense visual images of yellow, green, red, pink, lavender or brown. As you may know and as I am reading at the moment, sight and sound are closely linked to taste (Heston knows best!). But apart from the colours, it was the antithesis of textures which intrigued me as well. Crunchy and smooth combined together in a tiny colourful delicacy, which happens to go perfectly with tea, coffee, milk and maybe champagne? I need to check on that. Far away from my bookshop in Athens, a year later, with my new life now being a breath of fresh air on its own, I get ready to celebrate my 31st birthday. Between being very diligent with my finances this year and not having had the time to cook as much as I want, I need some gastronomic excitement. A culinary adventure, trying something unfamiliar is the best gift I could give to myself. Birthday as it is, I will go to Ladurée. So, on a cool British morning, I walked away from Piccadilly Circus, towards Fortnum and Mason. I was tempted to enter, but I remained focused and continued searching for Ladurée, looking at my google maps every two seconds. I used my posh French accent to ask for directions; I was not understood by a French waiter; I continued walking; after going around the block a few times, I arrived at my destination. The shop was tiny, the macarons laid neatly and colourful in rows, the saleswomen were...well, the opposite of colourful but I was smiling. Excited at the prospect of trying something new (and finally seeing what this craze is all about), I took a box of 8, of course with different flavours. 12.80 pounds later, Mr N and I were sitting in our living room, staring at the macarons, waiting for them to come to room temperature. At times like this, beware dear reader, times goes by very, very slowly. I first tasted the milk chocolate one. It was interesting but nothing more. Very tasty, chocolaty, I liked the contrast in textures but I would not go back every week and buy it for my afternoon tea. Similarly, the vanilla one was simply interesting. Mr N loved a light pink one with rosewater flavour because it reminded him of some funny looking biscuits he used to eat as a child, which he immediately googled and showed to me with a huge smile on his face. Memories aside, these were very good macarons but nothing extraordinary. The lemon and pistachio ones were my favourites, while I also liked the dark chocolate one. Yes, so far I liked them and I would definitely have them with my tea. But is that it? Then it happened. There are simply no words to describe it. The intense taste of sticky salted caramel clashes with the crispy exterior, like the waves in the sea crash on rocks, creating noise, turmoil, chaos...before pulling away calmly, leaving only the sound of seagulls in the atmosphere. Then again, another bite, explosion of pure, raw yet somehow delicate and fine taste. This macaron, in its extraordinary perfection, epitomizes the reason I am here in London, the reason that I am writing this blog, my raison d’ etre. For if flavours like this exist in the world , the quest for their discovery is what makes the difference between ennui and excitement, between monotonously passing through life and “grabbing life from the hair” (as we say in Greek). Yes, maybe this is what this craze is about. The colours, the textures, the images of chic women with flowery dresses sipping afternoon tea, carefully biting their macarons, twittering like birds…but maybe it is also for the anticipation, for the chase. A box of macarons, like a game of hidden treasure may lead you to unexpected avenues of pleasure. To paraphrase Forrest Gump, life actually may be like a box of macarons. You never know when another salted caramel will come along, but only if you keep on tasting will you find it. As I keep searching for the next salted caramel macaron, I think it’s time to order that book and create my own, what do you say? I've never tried a proper macaroon either! Ahh, what an opportunity missed.